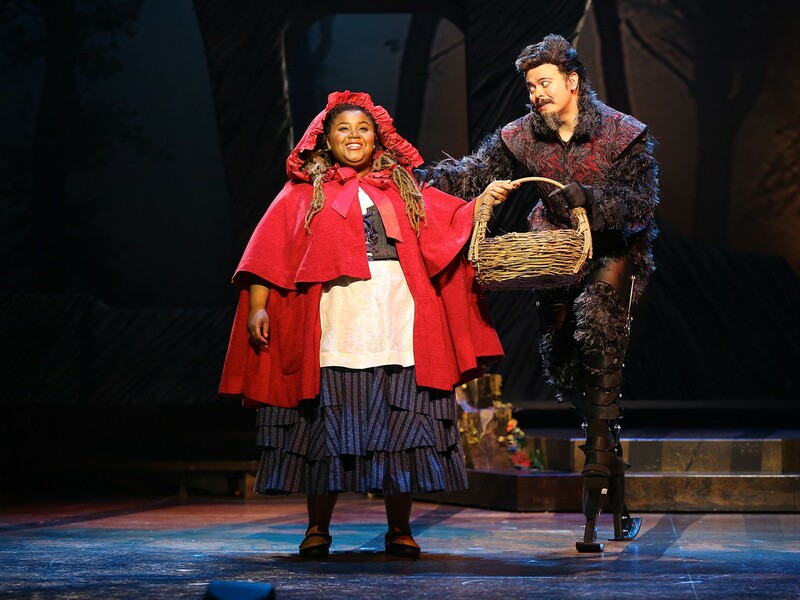 Jade Jones as Little Red Ridinghood and Christopher Mueller as First Wolf. Photo by Carol Rosegg. Peter Flynn (Ford's Ragtime, The 25th Annual Putnam County Spelling Bee, 1776) returns to direct this fanciful tale about the lengths to which we’ll go to get what we wish. 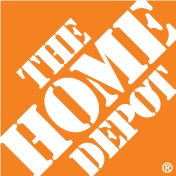 This production is Helen Hayes Awards Recommended©. 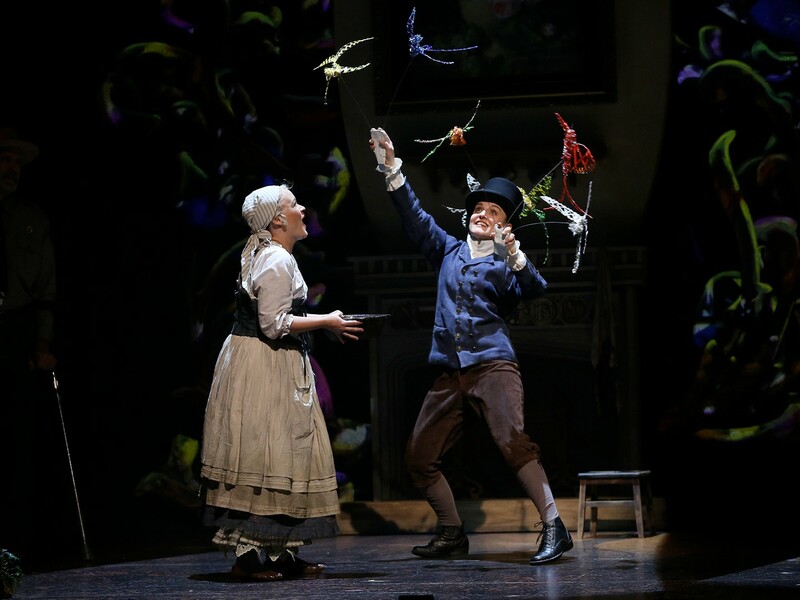 Erin Driscoll as Cinderella and Karen Vincent as the birds in the Ford’s Theatre production of “Into the Woods,” directed by Peter Flynn, choreographed by Michael Bobbitt and music direction by William Yanesh. The production features Scenic Design by Milagros Ponce de León, Costume Design by Wade Laboissonniere, Lighting Design by Rui Rita, Sound Design by David Budries, Projection Design by Clint Allen and Hair and Make-up Design by Anne Nesmith. Photo by Carol Rosegg. 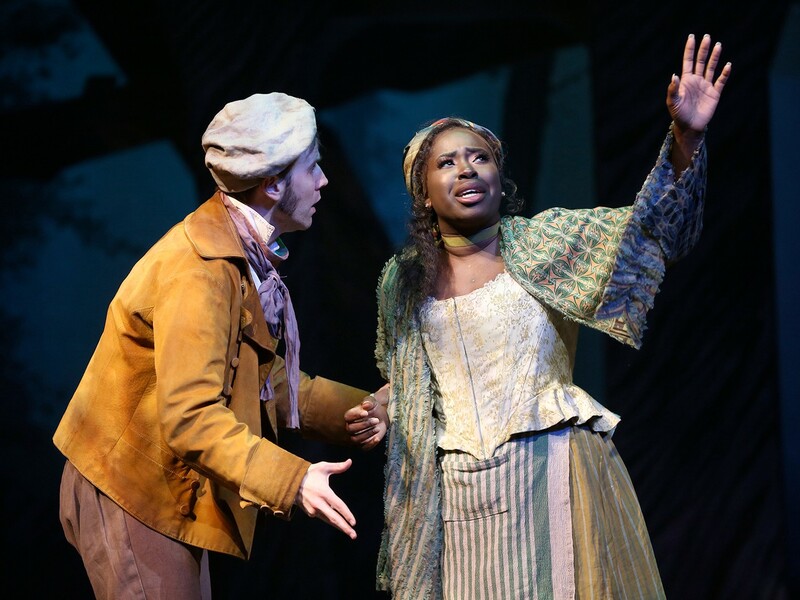 Evan Casey as Baker and Awa Sal Secka as Baker’s Wife in the Ford’s Theatre production of “Into the Woods,” directed by Peter Flynn, choreographed by Michael Bobbitt and music direction by William Yanesh. The production features Scenic Design by Milagros Ponce de León, Costume Design by Wade Laboissonniere, Lighting Design by Rui Rita, Sound Design by David Budries, Projection Design by Clint Allen and Hair and Make-up Design by Anne Nesmith. Photo by Carol Rosegg. 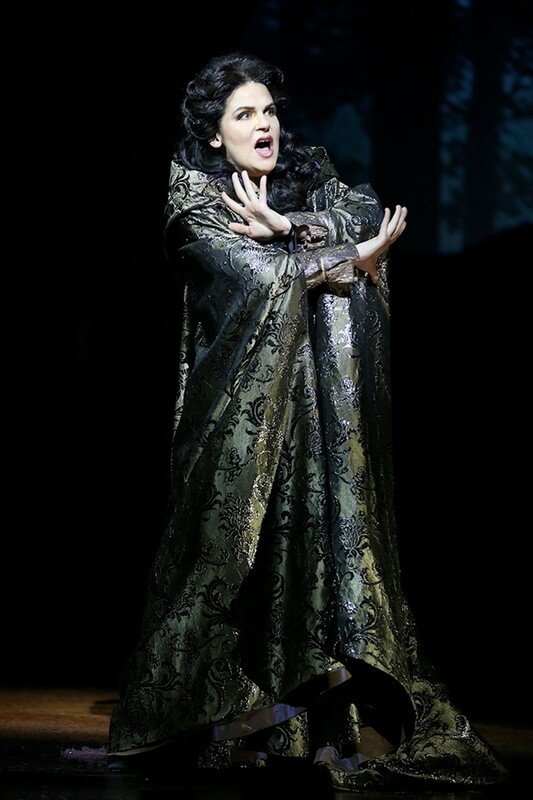 Rachel Zampelli as Witch in the Ford’s Theatre production of “Into the Woods,” directed by Peter Flynn, choreographed by Michael Bobbitt and music direction by William Yanesh. The production features Scenic Design by Milagros Ponce de León, Costume Design by Wade Laboissonniere, Lighting Design by Rui Rita, Sound Design by David Budries, Projection Design by Clint Allen and Hair and Make-up Design by Anne Nesmith. Photo by Carol Rosegg. "Delightful! It is eternally a lot of fun to watch as the characters, some fairy-tale famous, several others newly invented, contend with both magical catastrophes and everyday dilemmas." "Sensational! A hit! I couldn't wish for a cast better equipped to breathe new life into these characters. Awa Sal Secka manages to steal the show. She brings a richness to the Baker's Wife in every sense. Her lilting, resonant voice captures from the word go. The cast as an ensemble is a force. Jade Jones plays vivacious Little Red and will steal your heart. Rachel Zampelli is delightful as the Witch ... Evan Casey is sweet and sincere as the Baker. Special attention must be paid to Tiziano D'Affuso as Jack's bovine best friend Milky White." "Four stars! Somebody’s hauled a fabulous eight-piece orchestra into the enchanted forest of Ford’s new production of Stephen Sondheim’s "Into the Woods," and the brilliant, Tony-winning score, conducted by music director William Yanesh sounds great. A powerful voice and charisma come wrapped in a blood-red cape with Jade Jones’ Red Ridinghood, an appealing mix of wide-eyed fawn and tough cookie. Evan Casey (Baker) and Awa Sal Secka (Baker's Wife) create a sympathetic pair who in the midst of mayhem and mystery seem grounded in the reality of genuine human need, longing and loss. Casey limns a solidly comic Baker, and Secka simply sounds lovely always." "Zippy, hilarious! "Into the Woods" will make you feel the wonder of childhood." "Enchantment awaits! The production is further blessed with an excellent ensemble; beautiful, clear singing from all (Erin Driscoll, Awa Sal Secka and Rachel Zampelli stand out); and stellar scenic and design work investing all the make-believe with the requisite liveliness. 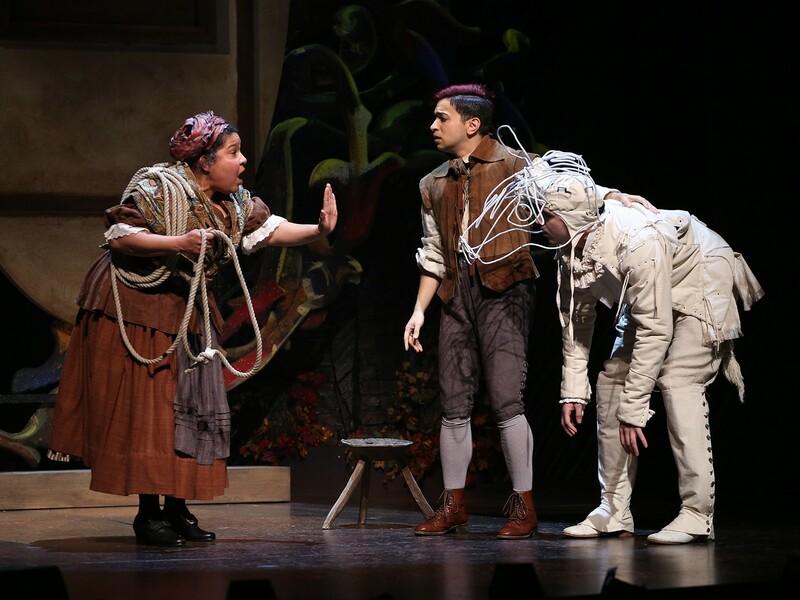 Ford Theatre’s spirited 'Into the Woods' is as bright and smart a revival as one could wish for." "Ford's full ensemble shines! There is no single lead in the show, but Awa Sal Secka takes the honors as the evening’s outstanding performer. Beyond its intensely intricate lyrics, beyond the humorous twists of familiar stories, beyond musical writing that remains stunningly fresh, this is a show that conveys, in an accessible and deeply affecting way, real wisdom about life and what we make of it. In a divisive time, insisting on the absolute necessity of community for survival, the need to act, the value of being able to tell our own stories, and the priceless treasure of the families we choose, "Into the Woods" has the truth of genuinely great art." "Majestic! It’s difficult to point out a standout performer in the cast, only because every single one of them is so darn good. If pressed, let’s first name the true leads of the ensemble cast, Evan Casey (Baker) and Awa Sal Secka (Baker’s Wife), who not only have the chemistry of a married couple when together but individually surpass expectations both vocally and as actors. The Witch (Rachel Zampelli) exhibited the perfect amount of “why-am-I-cursed-to-live-next-to-such-dumb-people” (that’s a character trait, promise). 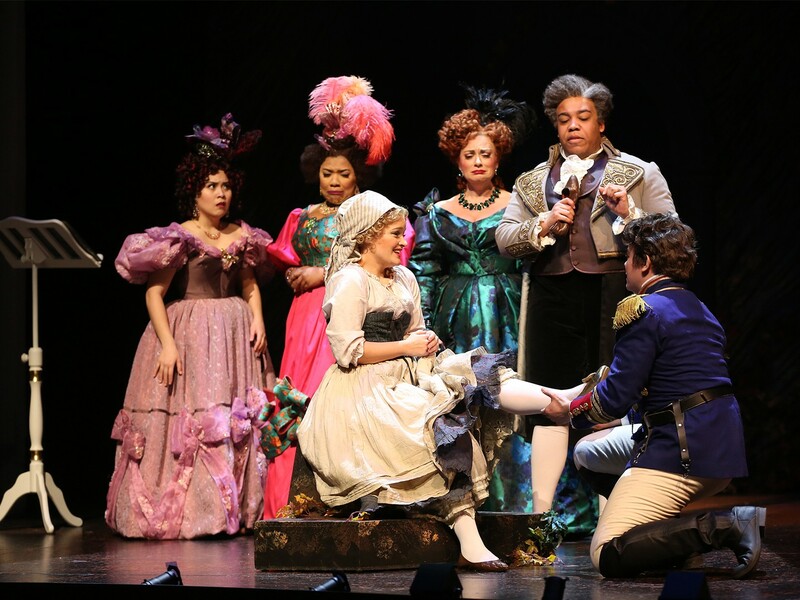 And let’s not forget Cinderella (Erin Driscoll), who is pure delight, and her prince (Christopher Mueller), who plays that over-the-top charmer with pinpoint perfection."